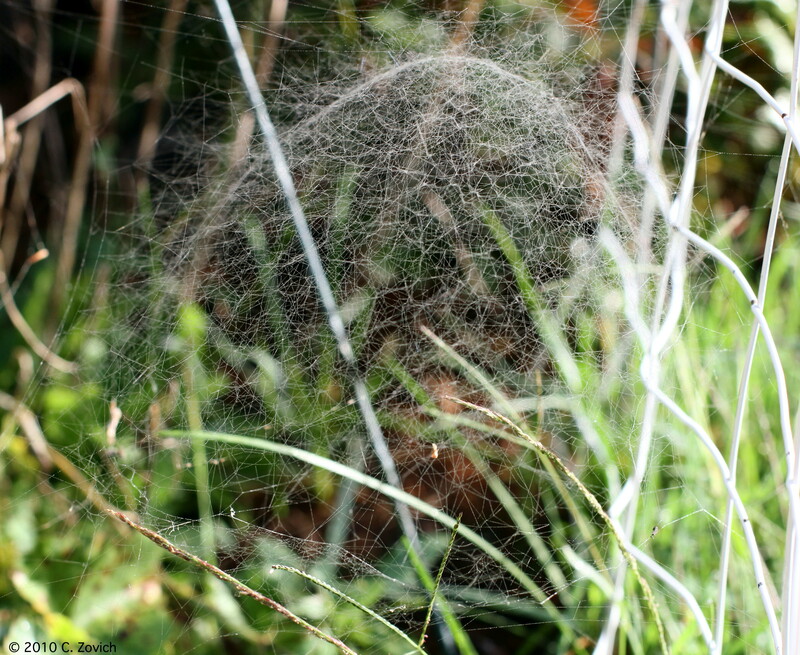 One of the hazards of shooting spider webs is that ocasionally the occupants are home! 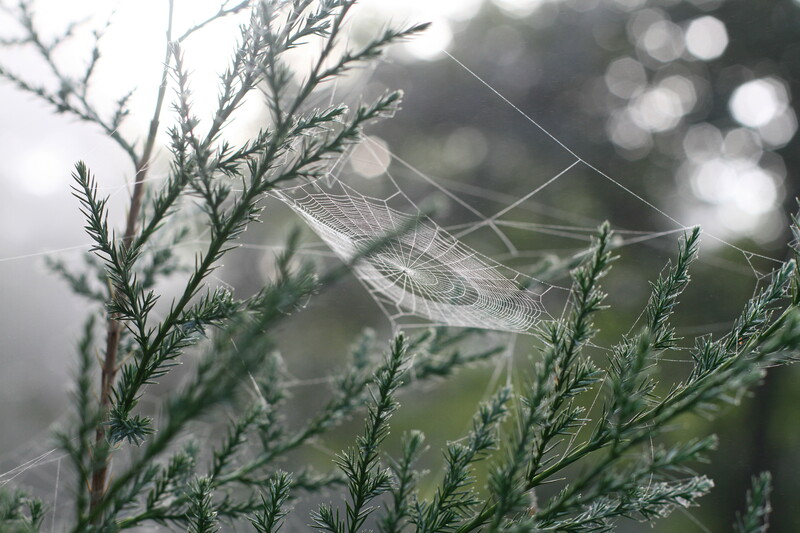 Another web photo taken a few days ago. 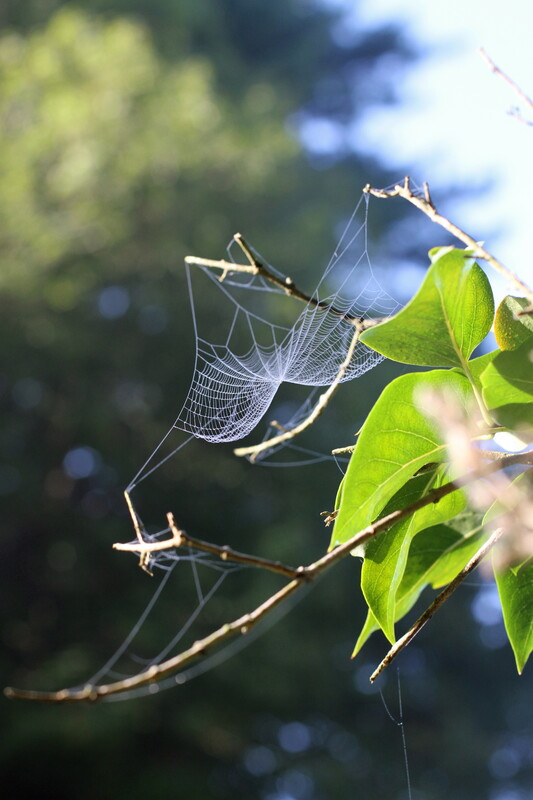 This web was very hard to get due to it’s being up high and catching more light than the others. I had very little room to maneuver and my tripod was on an incline. I was also getting shredded by mosquitoes. 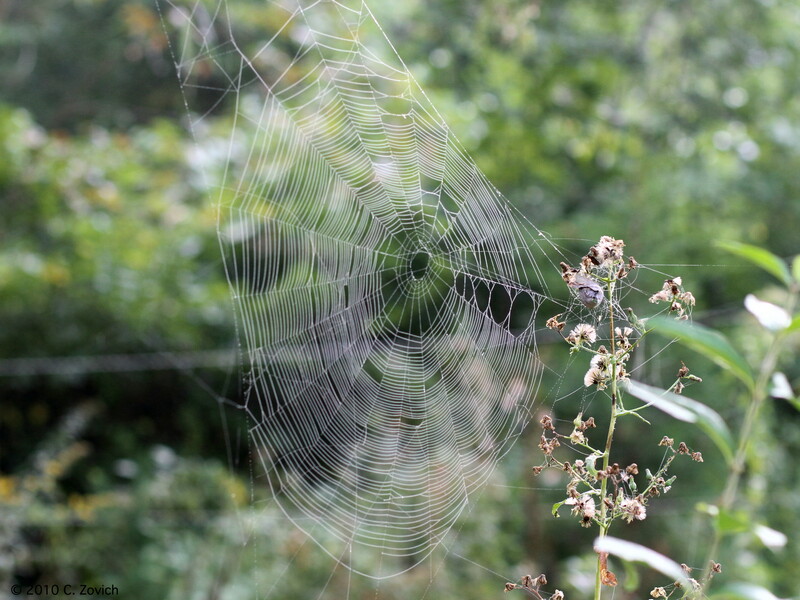 I tried to get the whole web in the frame, but it proved impossible and I had to settle for what I have here. 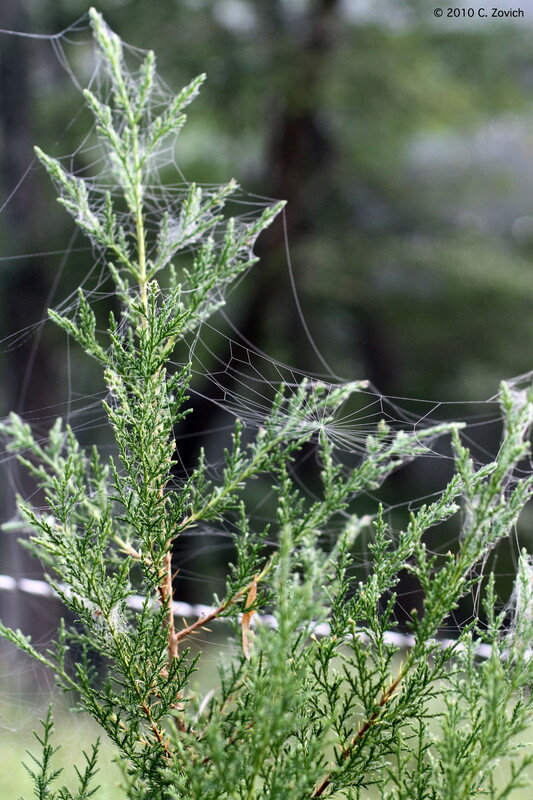 Same web, taken from behind the shrub it was suspended in. Ride or shoot? That’s been my conundrum the last few mornings. Sadly I can’t do both, and with the recent hot and humid weather I have to weigh the options and decide pretty early in the day. I was out on Dharla quite early the last three mornings and so as I made my coffee I seriously considered giving her a morning off. My camera was vying for my attention. One of the hardest things about outdoor photography is learning what conditions are most likely to produce which results. 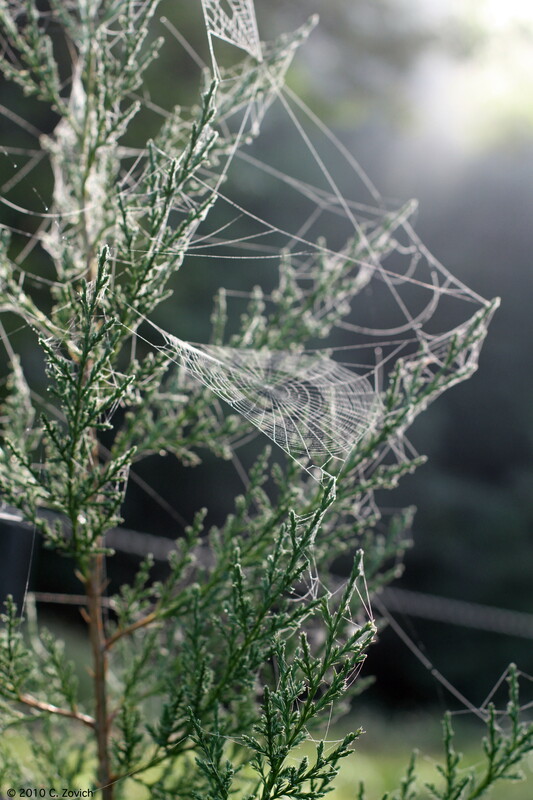 For instance, this web shot. 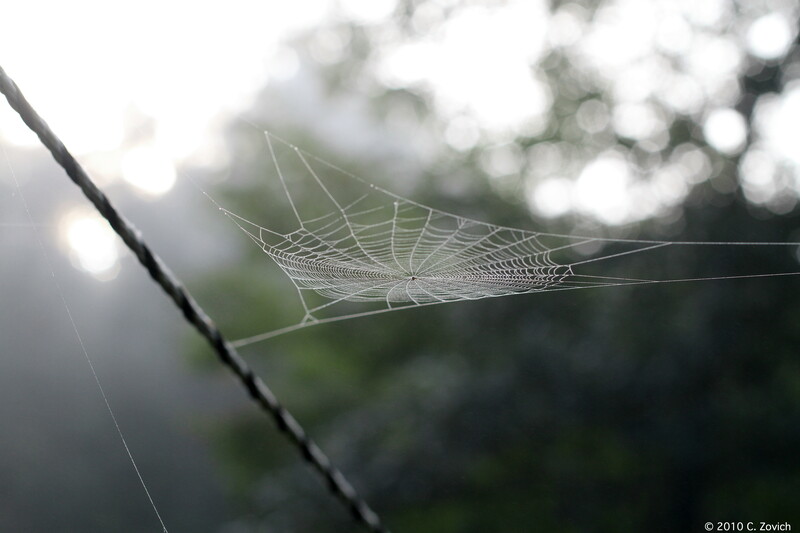 Last summer I got lucky and captured about 200 web shots in one morning. 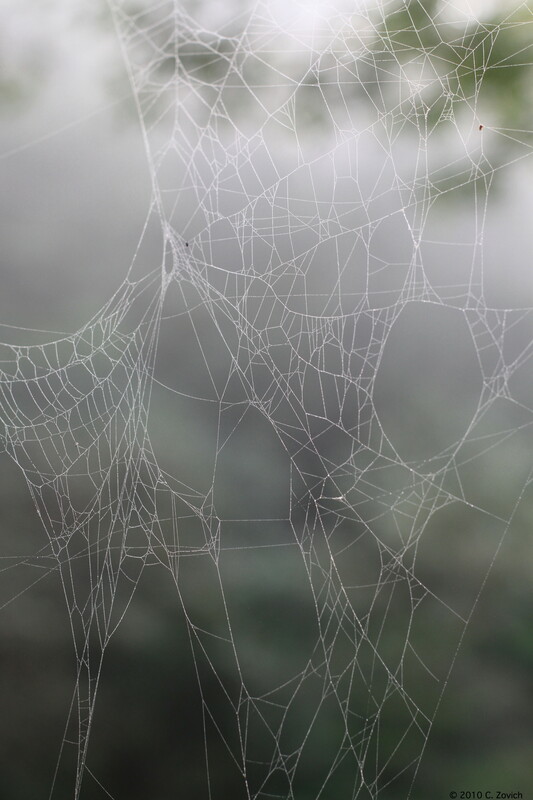 I didn’t have the foggiest idea what I was doing at the time (hence, the luck part), but the conditions were ripe when I accidentally stumbled on a smorgasbord of webs. 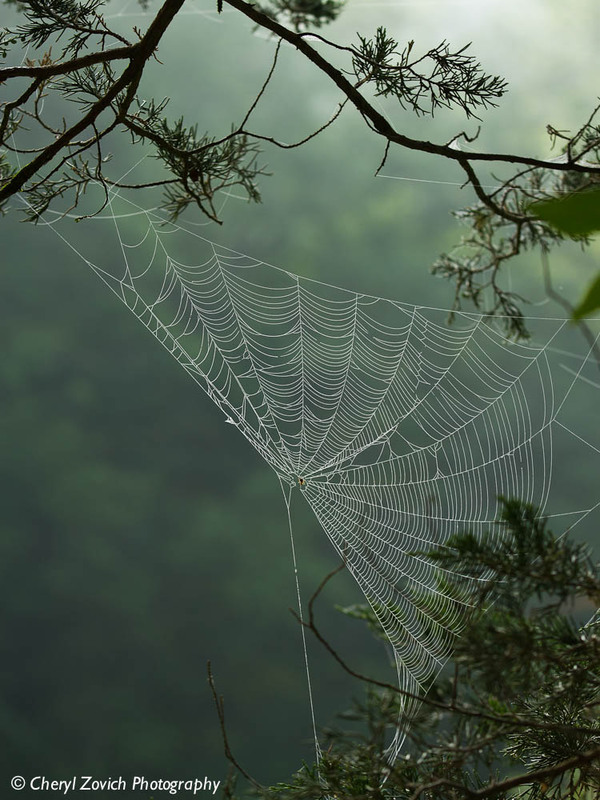 I grabbed my camera, shot like mad and about twenty minutes of frantic shooting resulted in maybe a dozen or so good shots of several different webs. 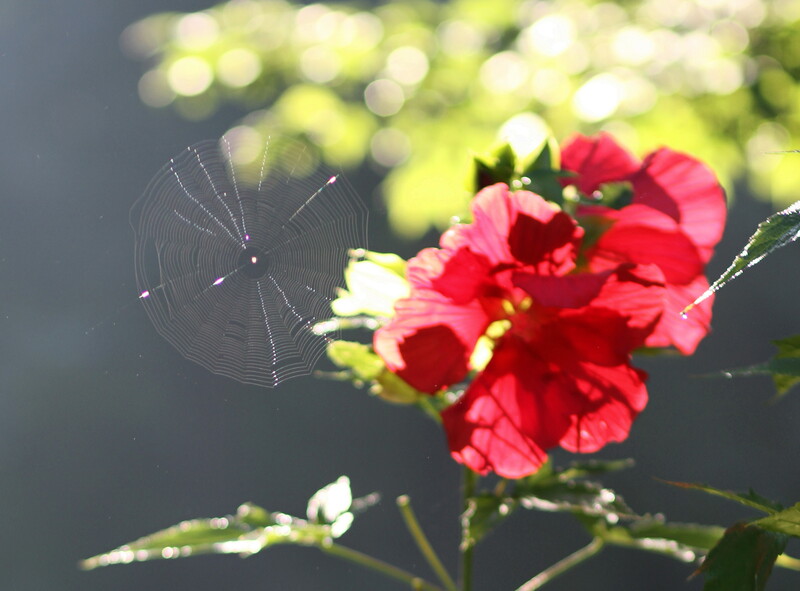 At the time I didn’t know it, but that day last summer the conditions were perfect for shooting spider webs. 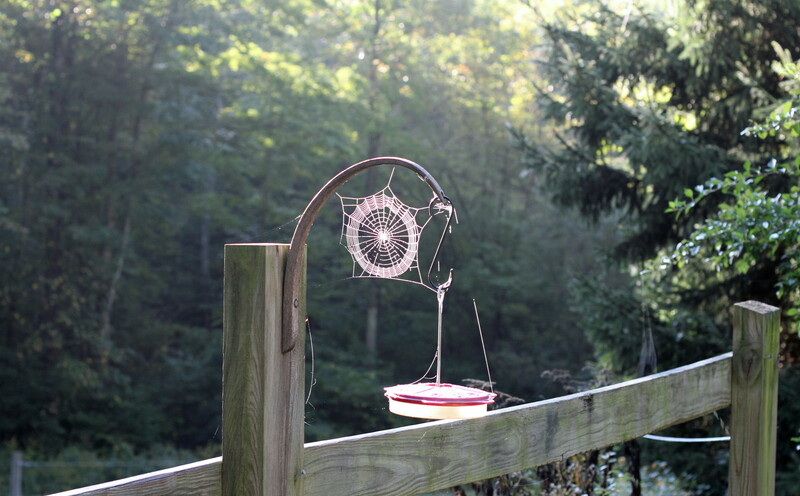 In fact, they were so good that I had more webs available than I could shoot while the light was just right. 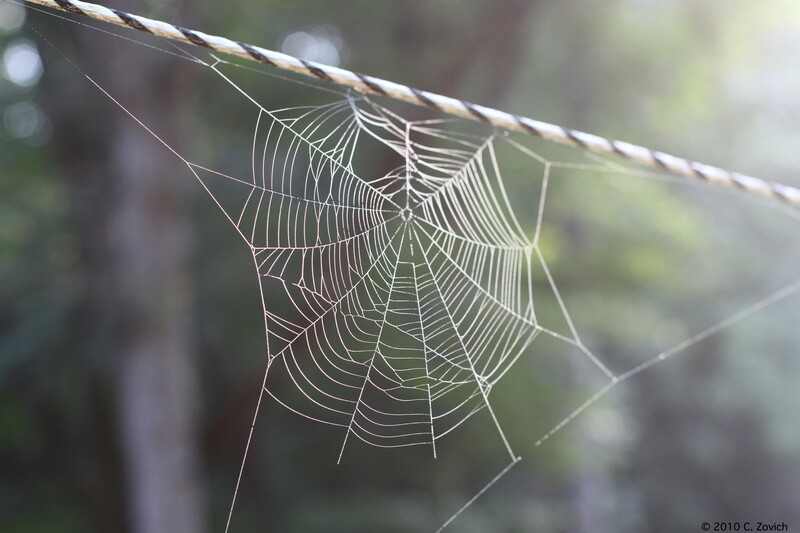 Daylight is constantly changing and spider webs are very light sensitive; they can be perfectly visible one minute and totally gone from sight the next. 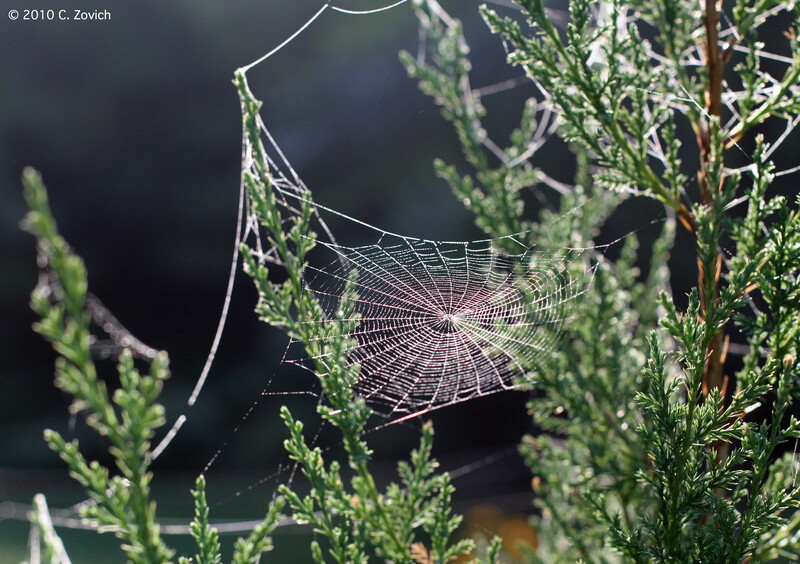 Also, it was very dewy that morning which helped the webs stand out from their background. 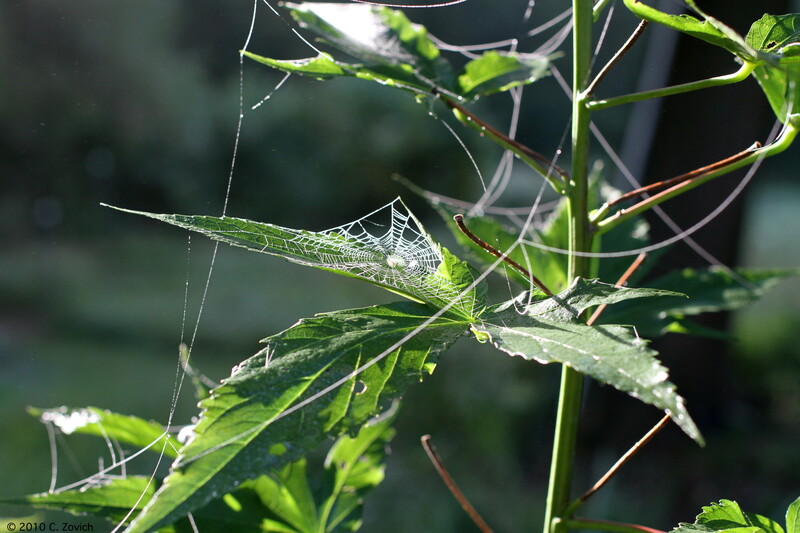 But dew dries quickly in the morning sun and once that happens a web will start to vanish or get much harder to photograph. Last but not least, that morning it was muggy and STILL. Uncomfortable for me, but not a breath of air moved. 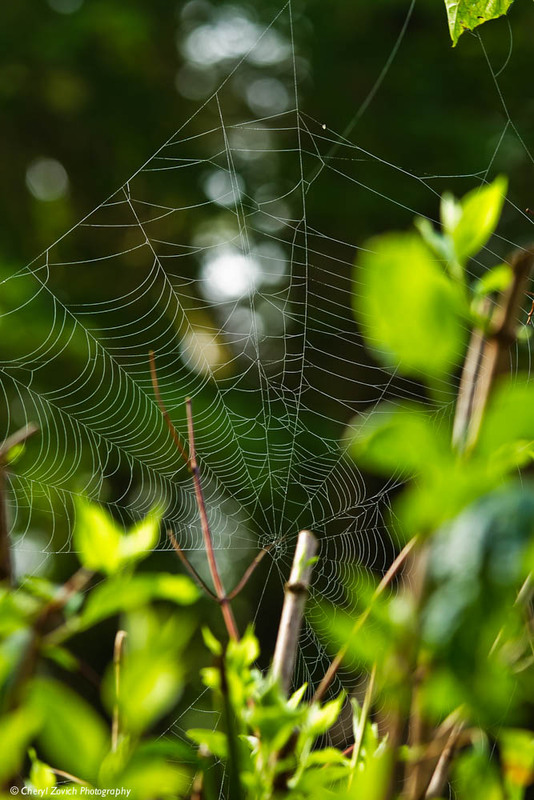 That’s so critical when shooting a delicate spider web. 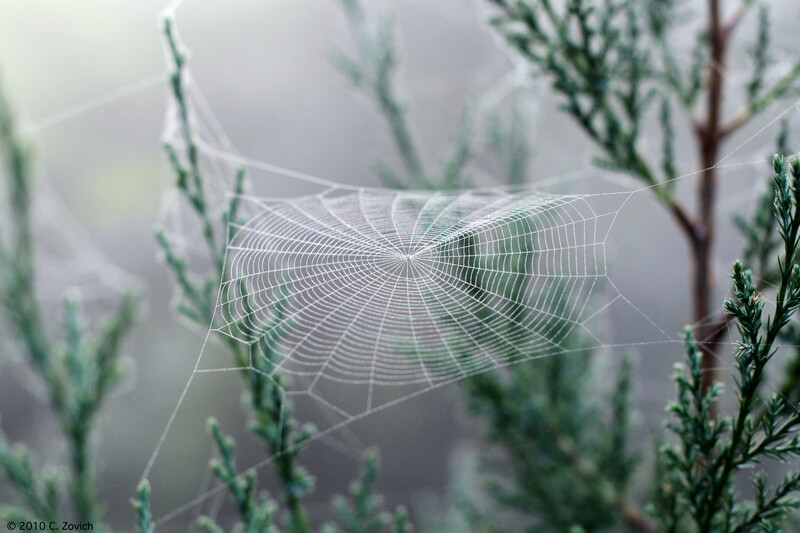 Most of the webs I shot that day were strung in bushes and trees. 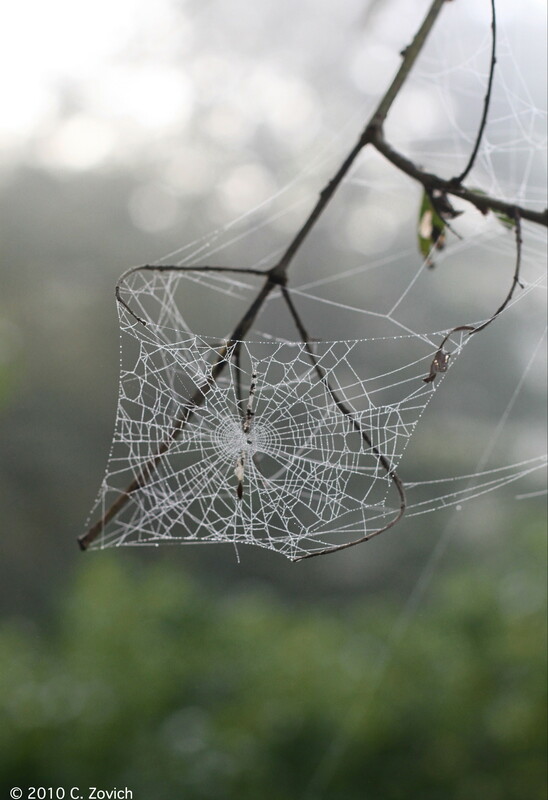 All it would have taken for the webs to move is a faint current of air. That further complicates a shot. So yes, I got very lucky that day and I came away with plenty of pictures. This morning was a bit different … as they all are! 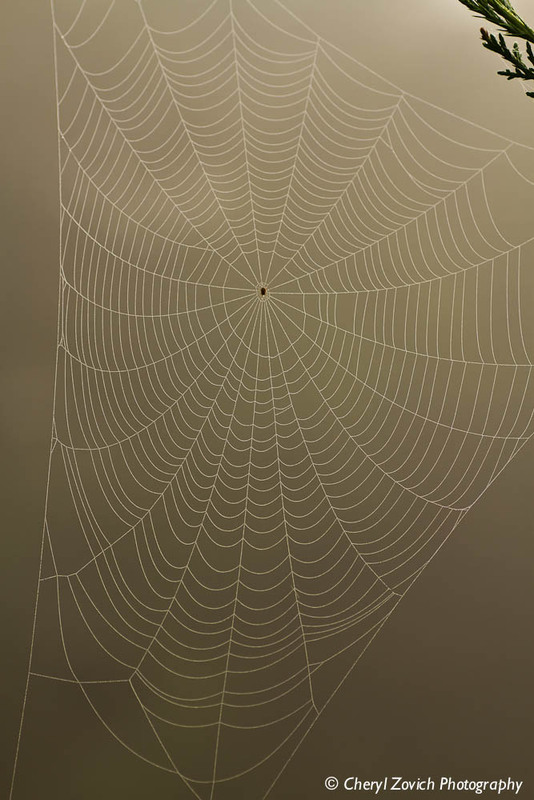 I had a feeling the conditions were ripe for web hunting. 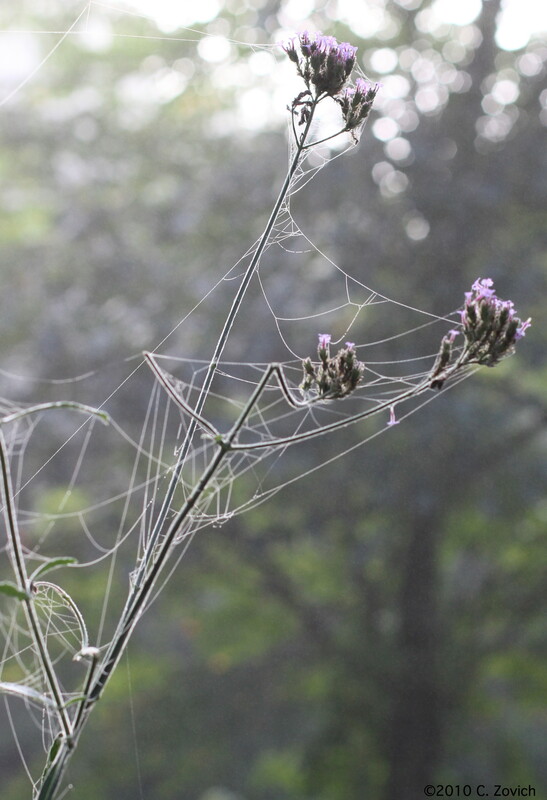 There was a heavy blanket of mist in the air and it seemed quite still. I took my mug of coffee and walked outdoors to scout about. 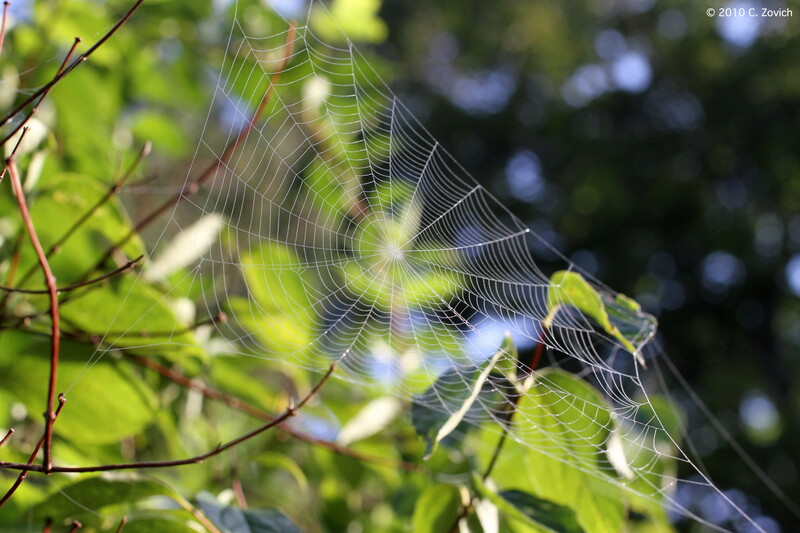 I didn’t have to go far before I spied several nice webs. 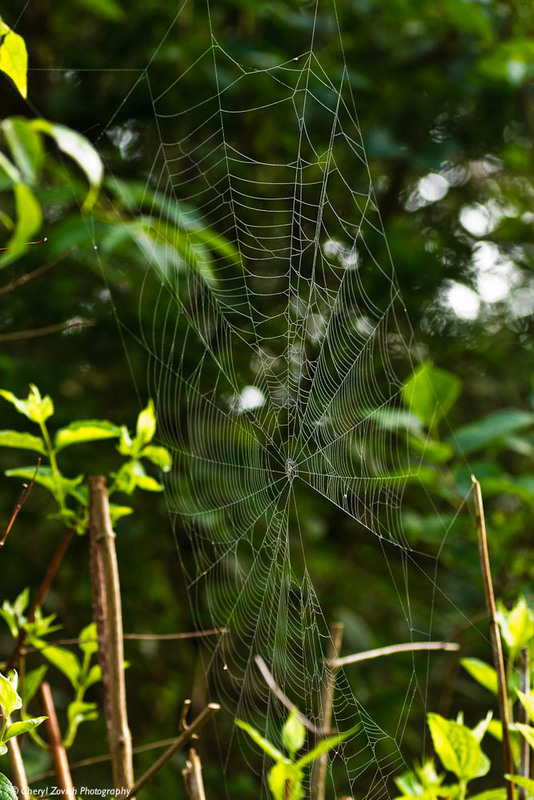 I literally ran inside (no dogs out to mow me down), grabbed my tripod and gear and headed back out to try my luck at shooting some new webs. Unfortunately, there was just enough of a gentle current to make things pretty challenging. Sometimes I can simply wait until I get a slight break in the breeze, but with the light conditions rapidly changing that wasn’t a good option. In the end I did manage to get some nice photos, but not as many as I would have liked. 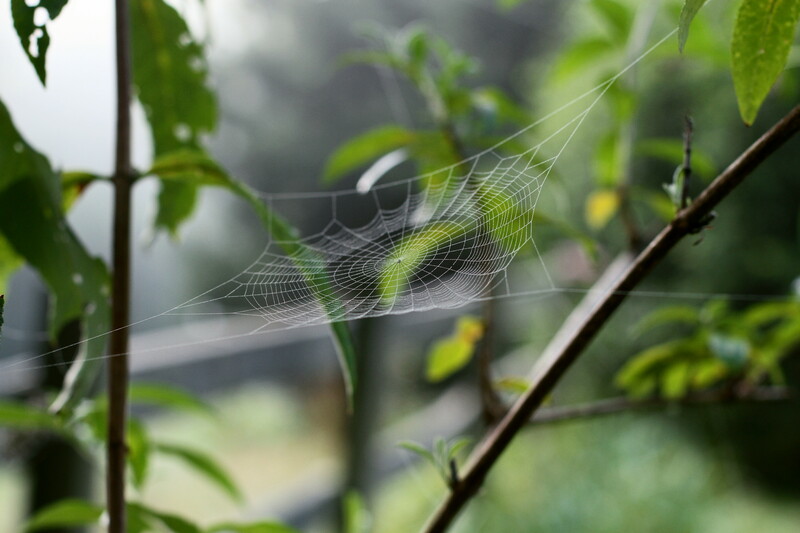 I tried to concentrate my efforts on just four webs instead of running to and fro and trying to shoot several more. 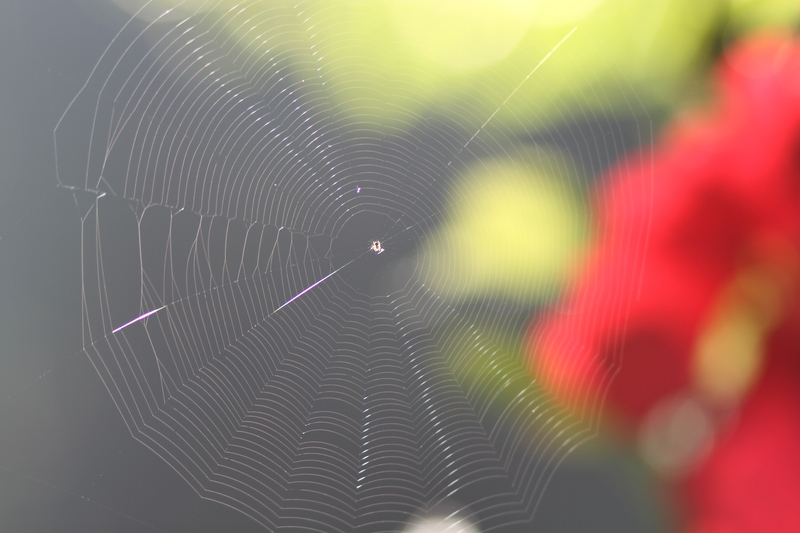 It’s still early in the summer and I suspect there will be more opportunities to get web shots this summer. 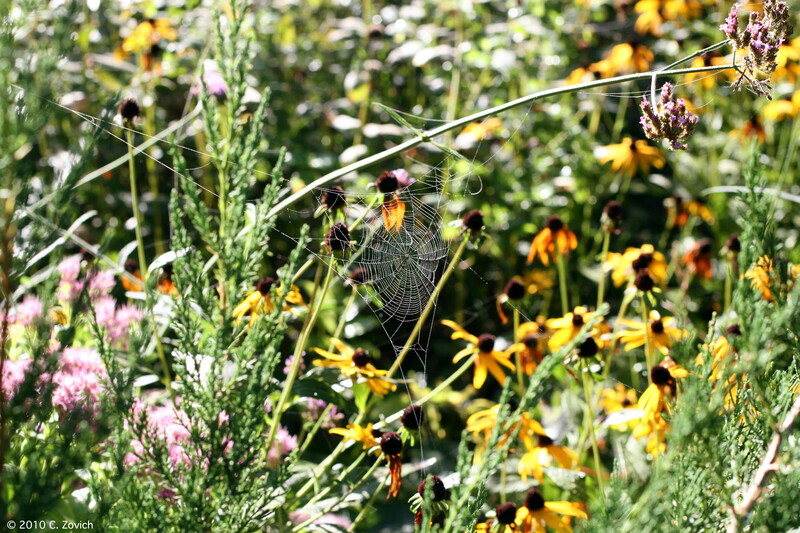 My apologies to those who are afflicted with arachnophobia. 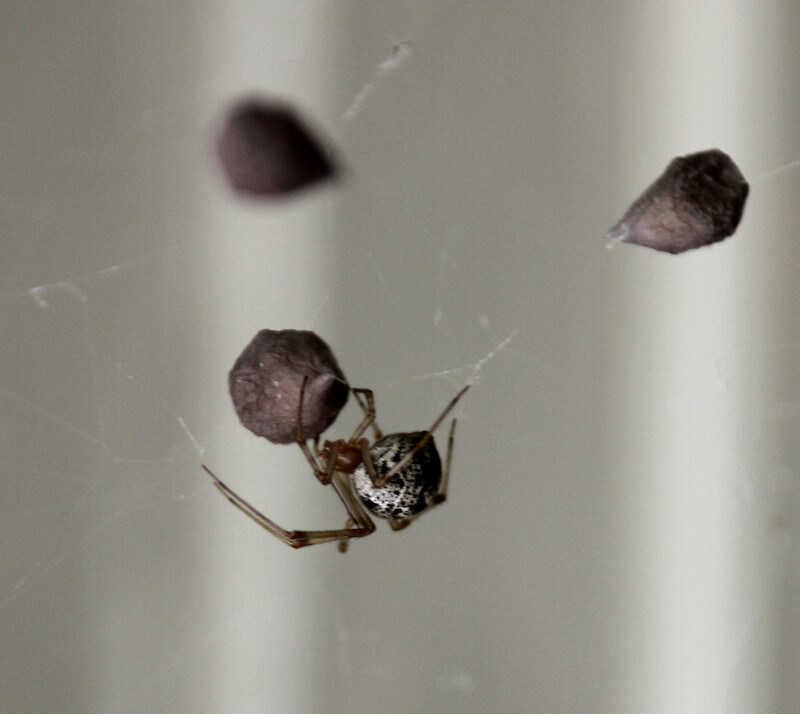 I’m not one of them, but I have to admit, shooting this guy (or gal) was a bit creepy. 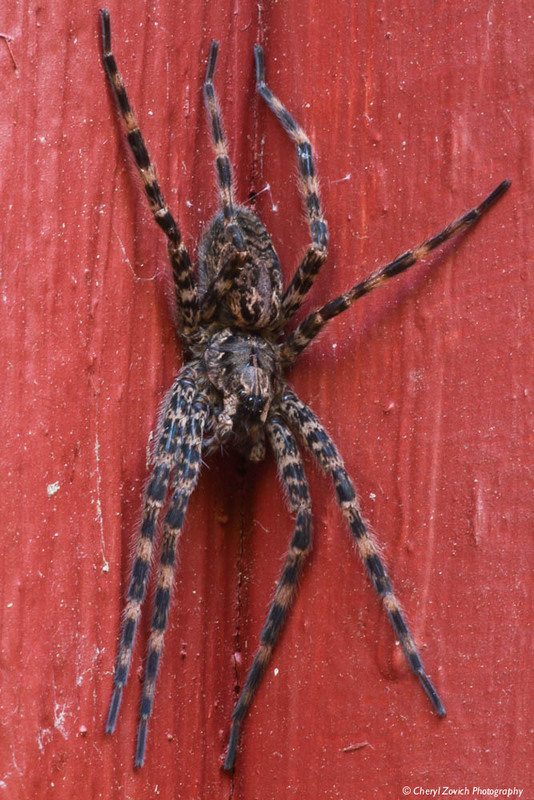 Wolf spiders can move very fast and are great jumpers. Even though I was using a 90mm lens I still had to get pretty close. The first few shots I half expected the thing to leap right at me, but when it didn’t move I started to relax and focus on getting a decent shot. Which I didn’t do. This is the best of probably two dozen or so frames. None of the pictures I took were great and I’m not really sure why. They all seemed a bit “cloudy” or slightly out of focus. 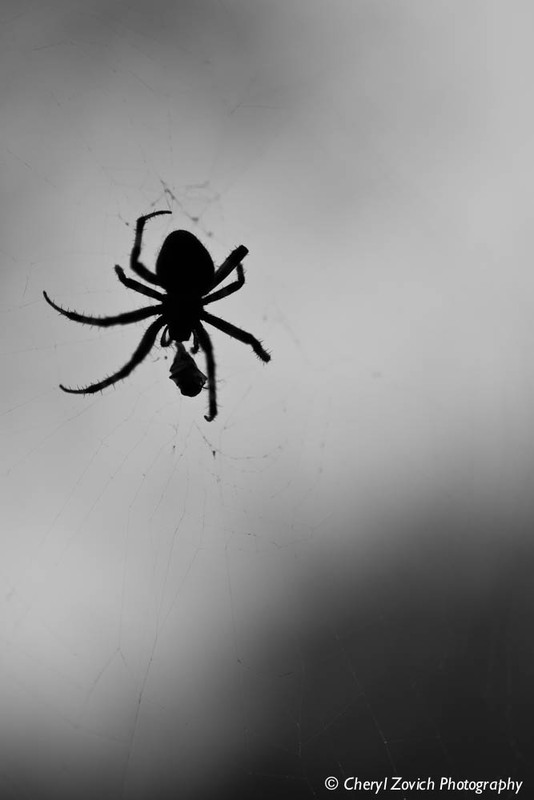 I do recall the spider was moving it’s curled up, tiny front legs … or whatever those things are right by it’s head. It seemed to be quite aware of my presence and that was the reaction it had; to curl and uncurl those little legs over and over again. Like I said, it creeped me out so perhaps I wasn’t paying enough attention to what I was doing at the time? I dunno. I was really excited about having the chance to shoot this critter right out in the open. 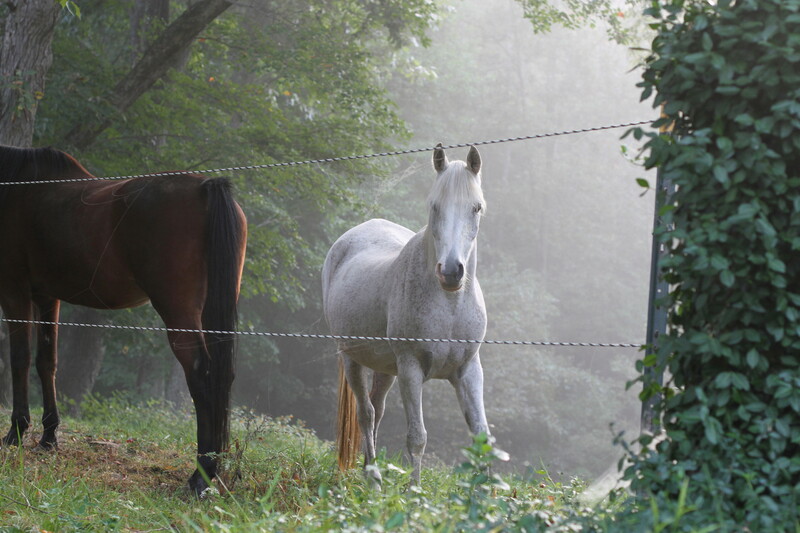 Usually I find them tucked off in some dark, damp corner of the barn or someplace where it’s nearly impossible to get a good shot. So knowing what a great opportunity this was, I thought I was really taking my time and thinking about each shot. But apparently I wasn’t because I ended up with crap. Or maybe it’s just me? I’ve been struggling quite a bit lately with vision problems. My right eye already has some significant macular changes, and then there was that fall a few weeks back. I was running from the barn to the house (to grab my camera … the ducks were in the pond!) when the red dog came tearing around the back of the house and plowed into me, taking me out at the knees. Who woulda thunk? Six and a half acres to move around in, but the dog chooses the same path I’m on? Sheesh! I never saw him coming and I went down hard. Let’s just say that if the injury doesn’t kill you the diagnosis will. Good grief. I’ve been though a LOT of bizarre medical tests, but they all pale in comparison to having a retinal specialist “examine” your eyes for a detatched retina. How do these doctors get away with such archaic torture in this world of modern medicine and technology? Apparently, ocular medical advancements stopped somewhere in the 1700’s! I’d rather they just hand me a patch and a parrot than go through that examination again! But hey, what’s the fun in that? So I have to go back in two weeks to get poked in the eye again. Good times! But enough about me. I’m not sure why this picture isn’t as good as it should have been … and I’m pissed. 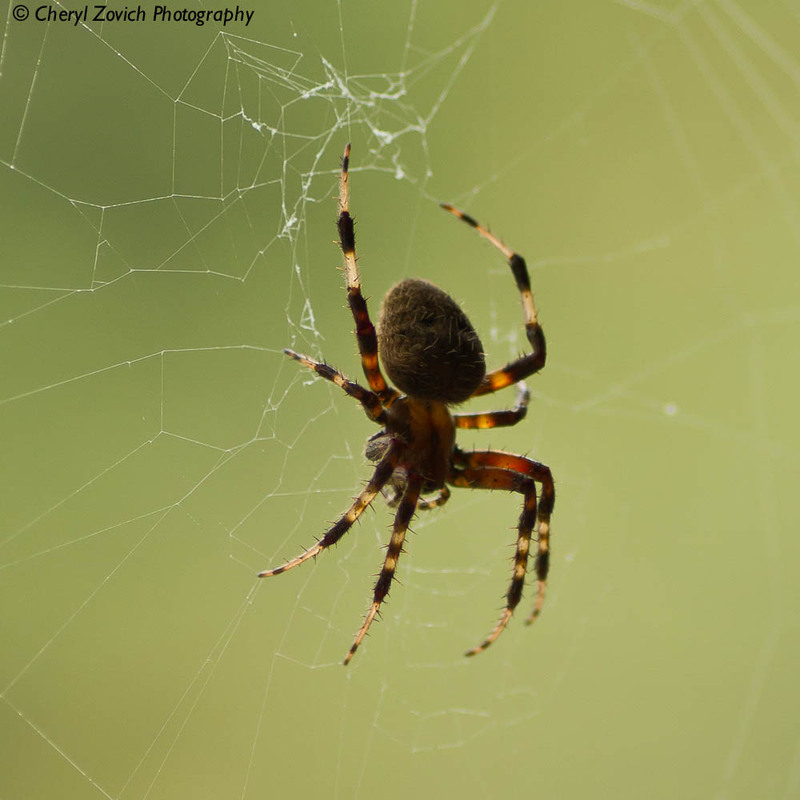 Who knows when I’ll have another opportunity to shoot such a cooperative, huge spider again? I blew it. And the eye? Meh. Just another cross to bear. 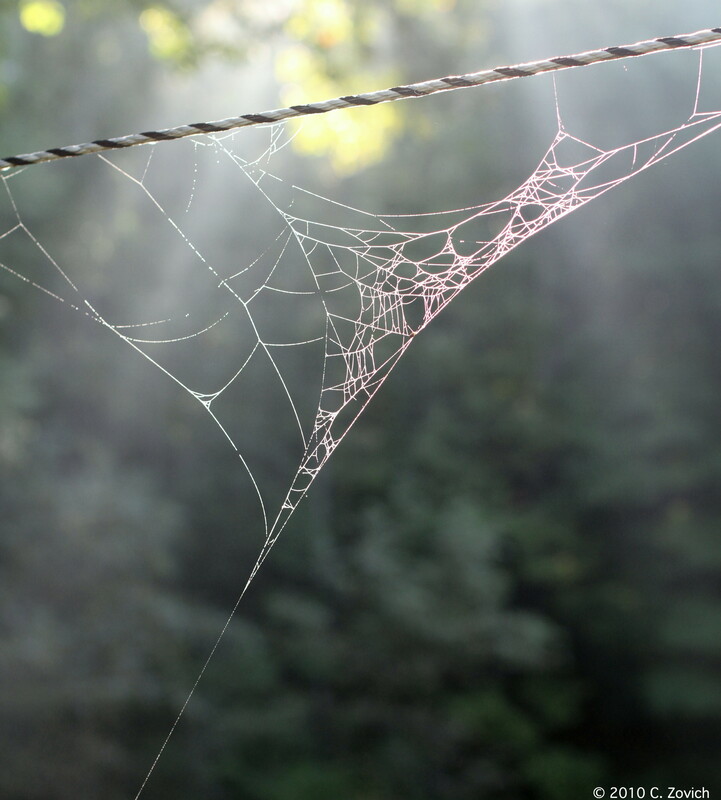 Perhaps I’m being redundant, but last week I awoke to find I had perfect conditions for shooting spider webs: heavy dew and filtered morning sunlight. 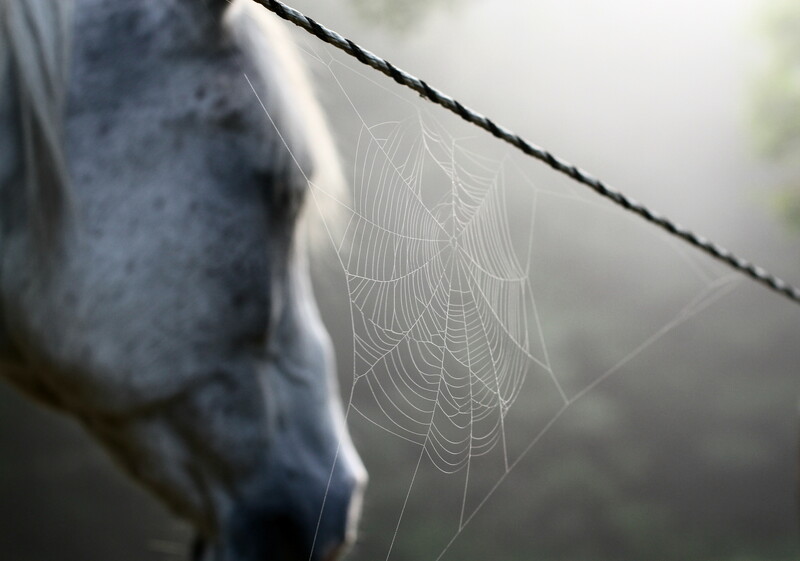 I was nearly late for a herding lesson because there were so many great webs to shoot! 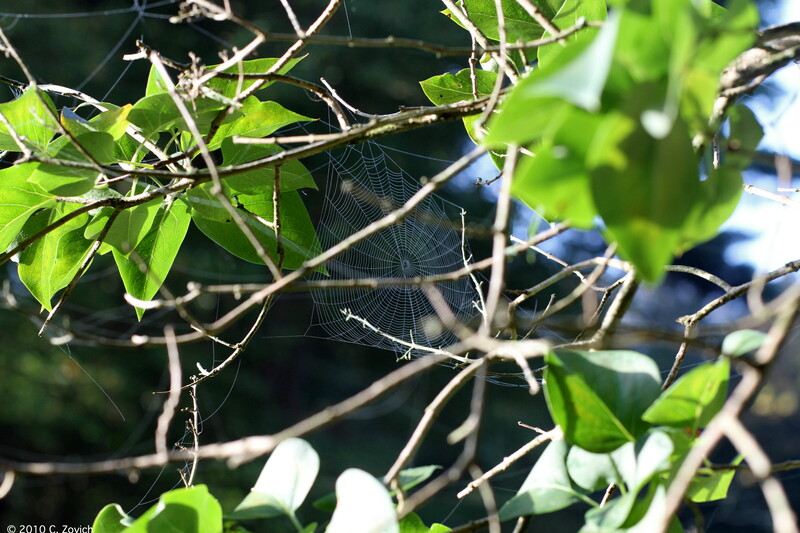 and webs suspended in dangling tree limbs! Not a bad show for a few minutes work and a quick walk around the back yard! Imagine what I could have captured if I’d had the time to hike the entire property? Next time! 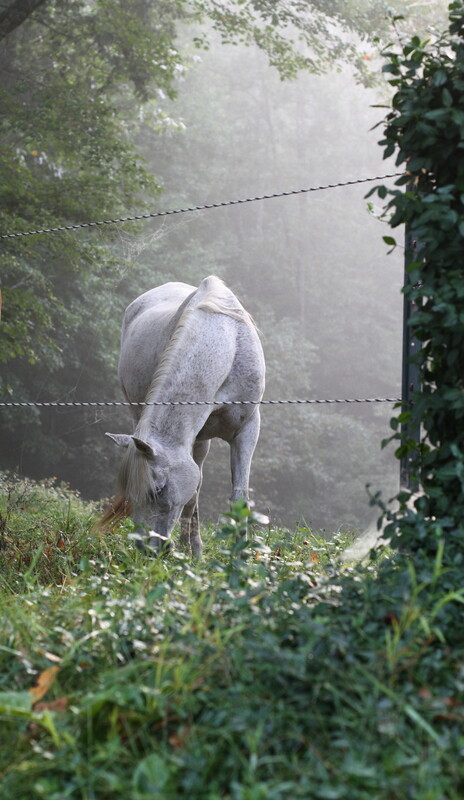 It was a beautiful misty morning and I could hardly tear myself away from taking pictures long enough to get the animals fed and my day started. 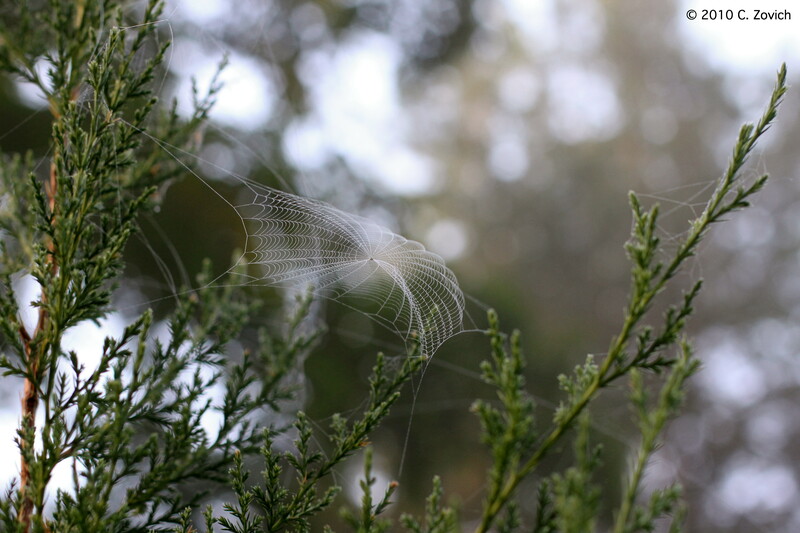 There were dewy webs draped all over the garden and shrubs. 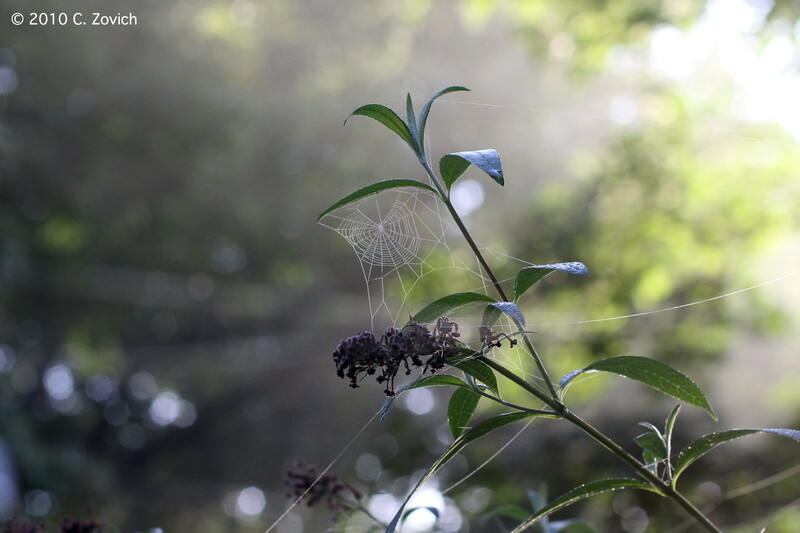 As the sun began to break through the trees I moved from spot to spot, looking for webs to photograph. 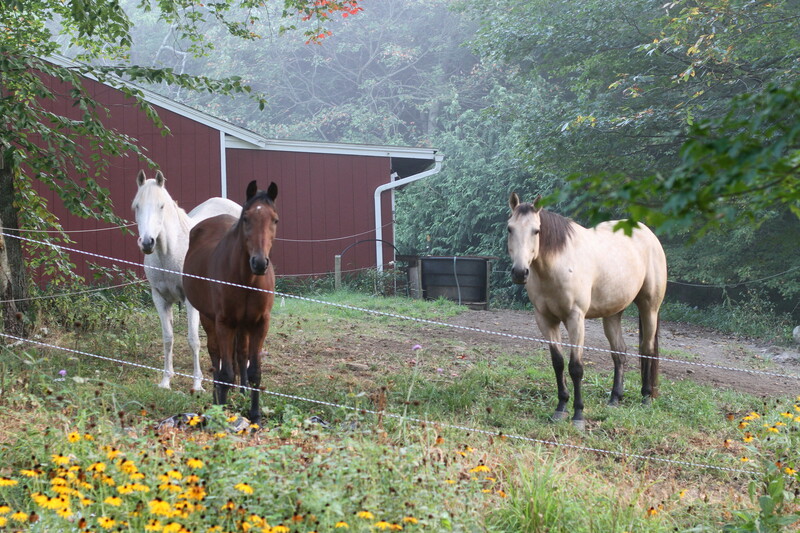 The horses were not impressed and wanted me to come feed them. 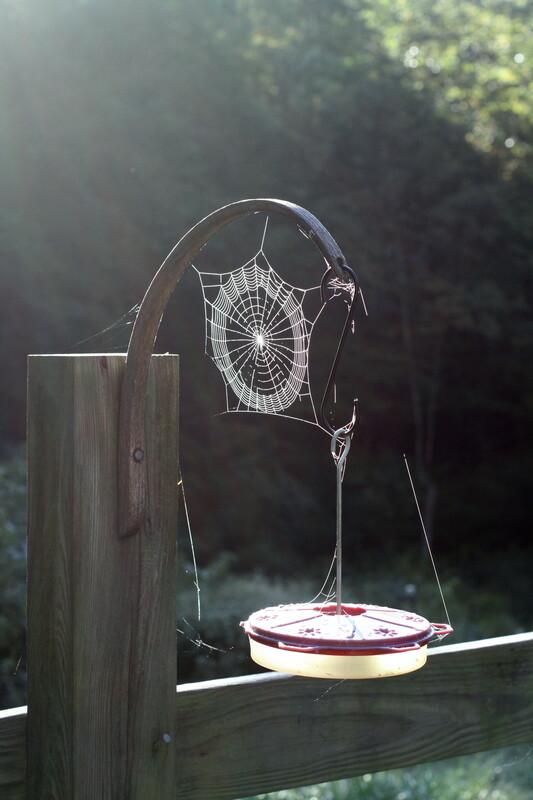 while I searched for that “perfect” web shot. And then, when I finally thought I’d had enough, I turned to take my camera back inside. That’s when I saw it. I don’t know how I missed it before, but maybe it wasn’t visible until that very moment. It certainly was worth waiting for! As if to tell me, my dream is all right. My love dreamt of me. We rode side by side.